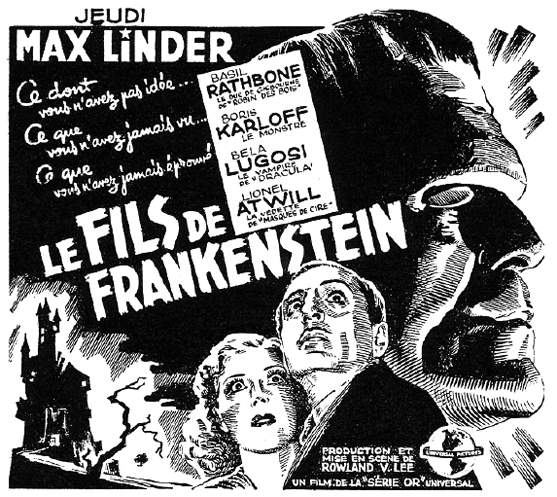 Gorgeous pen and ink drawings — artist unknown — adorn the ad mats for Son of Frankenstein (1939), playing at the storied Max Linder cinema in Paris. Max Linder, who gave his name to this movie house, was the world’s first movie comic superstar. Charlie Chaplin called him “The Master” and copied many of his routines. In fact, Chaplin’s Little Tramp character was created as an exact opposite to Linder’s urbane Max character. Linder was a tragic genius, given to bouts of crippling depression. Lured to Hollywood, his American-made films were not successful. Disappointed, Linder returned to Paris in 1914 where he indulged in an old dream of his, to own a movie house. He bought the sumptuous, 1200-seat Kosmorama, built two years previous, and renamed it the Max Linder Ciné. Unfortunately, because he held no rights them, he was unable to show his own classic films. By the early 20’s, Linder had sold the theater to other interests, but the famous name stuck. The theater would change hands again, first to Pathé, and eventually to the powerful Siritzky circuit, under who’s guidance the Max Linder would become one of the most popular movie houses in a city renowned for its many grand cinemas. Max Linder died in 1925, victim to a suicide pact with his young wife. It was their second attempt at it. The Max Linder was renovated in 1952, and again in 1984. It is still in operation today. 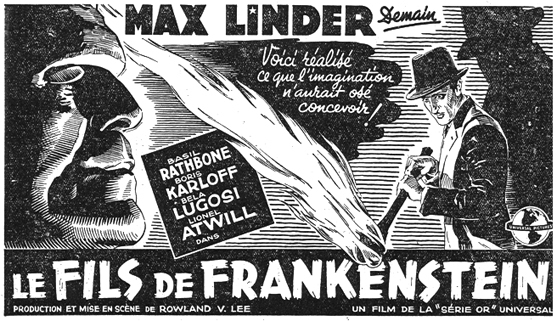 The Max Linder Cinema. Max Linder’s Wiki page. Images courtesy of Jean-Claude Michel. oh my god, are those beautiful. I always have a thought for the unsung artists who do these things. Beautiful work, here. See how the flame from the torch carries across the piece, dividing the space. In the bottom ad, I love those speed-line or explosion-like touches on the right. Someone very talented did these. I have some more coming up soon! 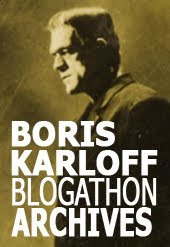 Have you seen this one for FRANKENSTEIN? That poster looks contemporary, the typo at the bottom looks like it was computer generated. 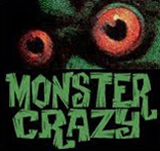 Probably a re-issue poster, or a video packaging job. Very nice illustration.